Isabel Yap writes fiction and poetry, works in the tech industry, and drinks tea. Born and raised in Manila, she currently lives in Boston, where she is completing an MBA at Harvard. Her writing has appeared in Year’s Best Weird Fiction, Year’s Best Dark Fantasy & Horror, Tor.com, Interfictions Online, and other publications. “How to Swallow the Moon” is Yap’s sixth appearance in Uncanny, a beautifully crafted story inspired by Philippine folklore. Uncanny Magazine: “How to Swallow the Moon” opens with a quote from a poem, and in addition to prose you write lovely poetry. How does poetry influence your fiction, and vice versa? Isabel Yap: I’m really glad I got to include the poem in the story! Barbara Jane Reyes is an amazing Filipino poet based in the Bay Area; I found her collection Diwata once in Moe’s Books in Berkeley. I emailed her to request permission to use this text before I submitted the story, in case it got accepted. I’m super grateful she agreed! She has a more recent collection entitled Invocation to Daughters that’s fierce, unflinching, and daring. I’d highly recommend people look up her work, or see her at a reading if they’re based in Northern California! I actually haven’t written poetry in a while—sometimes I moan to my poet friends about how I’ve lost it. I think poetry demands a lack of self-consciousness, and somewhere along the way I’ve built up enough self-consciousness that I’m afraid to utter. I think (hope!) that I’ll get it back eventually by trying and reading. Poetry is something alchemical and pleasurable for me. It’s much more intuition-based than fiction, so I try to bring some of that into my prose. The way words work, the cadence of a sentence—poetry taught me to listen to words, in my mind’s ear if not aloud. Plus I like reading poems to get inspiration; a lot of my stories were actually titled after lines from poems (including A Cup of Salt Tears, from Oscar Wilde; Only Unclench Your Hand, from Sylvia Plath; and All the Best of Dark and Bright, from Lord Byron). I think fiction influences my poetry in two ways. First is that I try, more and more, to bring in prose-like narrative to balance out the feelings that I’m exploring in my poems, so that there is something concrete for readers to latch onto. For example, The Multiple Lives of Juan and Pedro in Apex Magazine is basically a sci-fi story. The second way is that it’s all writing and any writing, whatever the form, helps me improve. Uncanny Magazine: This story centers around the bakunawa, a creature from Philippine mythology that swallows moons, and your stories often draw inspiration from folk stories and fairy tales. What draws you to these types of stories? What are the challenges of incorporating existing stories into your own work, and what are the advantages. Isabel Yap: I’ve always loved fairytales. There was this amazing series of Philippine folklore books that I read and reread when I was younger. An example from that series is The Termite Queen and Other Classic Philippine Earth Tales. Who wouldn’t want to read about a Termite Queen?! And I read all kinds of fairytales and myths too—the classic Hans Christian Andersen/Brothers Grimm stuff, Greek and Norse mythology, etc. Maybe part of it is the 90s Disney movie influence? It was always kind of an obsession for me; these stories can be charming, fascinating, brutal, all at once, and they can be retold endlessly. Challenges: Sometimes there’s the stress of writing from a culture that isn’t my own and not doing it justice. The Philippines is made up of so many tribes, and sometimes these myths and legends belong to them, and not me. (My family doesn’t have particular strong ties to provinces or our ethnic groups; we’re mostly Tagalog, and from Metro Manila.) The Filipino history is extremely fragmented, and I often resort to blending things—mixing all the influences that make up our culture, including names, objects, settings. Even in a secondary world I want to be sure I’m doing the best I can, as respectfully as I can. Another issue is wanting to ensure that this story gets told in other ways, by other people, too. I mean, if there can be a hundred Red Riding Hood stories, why can’t there be a hundred bakunawa stories? I really want to read other Filipino authors’ takes on these stories, and I don’t want to create any “that’s been done” barriers. Of course, if you’re doing a retelling, you want to keep things fresh, too. I think I have an advantage writing about Filipino myths because… well, we haven’t seen that many of them published yet. That’s changing, slowly. But the challenge when you’re working with existing material is always: what are you doing that’s different? Why is it worth telling this your way? On a more practical note, there are limited resources available for Philippine folklore. Even in our local bookstores they’re hard to find—sometimes you have to go to university bookstores (or pay a lot on Amazon!) to find resources for research. I use the internet a lot (The Aswang Project is a great resource), and I ask my friends or others back home, but there are always gaps that you have to fill. Advantages: it’s fun! There is really something delightful about building on top of an existing story, for me. You can play with expectations that readers might have, and subvert them in compelling ways. Maybe some of that is attributable to my fanfic-writing background. I love having a base to build scaffolding on; I love exploring the nooks and negative spaces, the what-ifs, the before-and-afters. Also I’m pretty bad at coming up with plots on my own, so having some basic guidelines to follow is incredibly useful to me. Uncanny Magazine: If you had to choose a role in this story, who would you be and why? Isabel Yap: Oh, interesting! Honestly I’m much more of an Amira in real life… cautious, caring, maybe a little too obsessed with what’s “right” in terms of a story playing out. I’m also pretty dense about relationships, so like Amira I’d be oblivious if someone liked me, and even if I liked them back I’d probably be too nervous to confess. So I’d love to become more like Anyag. She’s a go-getter; she’s not unafraid, but she’s able to move past her fear and isolation to get what she wants. And she’s not afraid to use what charms or skills she has. Lisoryo would be another option. He’s awful, but he’s got great fingernails, he’s hot, and he can fly. 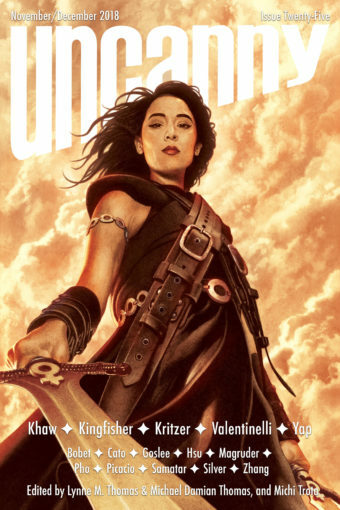 Uncanny Magazine: One thing that resonated for me in this story is the shift from self-sacrifice to fighting for what you want. The idea that history need not repeat itself—the old songs can be changed. Did you have this theme in mind when you set out to write the story, or did it emerge as the story unfolded? Do you find that there are themes you return to repeatedly in your work? 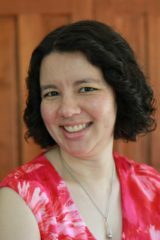 Isabel Yap: I always knew I wanted to write a story about binukot, and when the idea to incorporate a bakunawa occurred to me, I thought: oh, this is my take on a maiden-sacrifice story. I let my subconscious wrestle with this idea for a while. The core image that I wanted to get at was the maiden slicing her way out of the monster’s throat, and I knew singing would be involved somehow. But the theme became a lot clearer only when I realized I would be writing the story from Amira’s point of view. I wasn’t really sure who she was or how she fit into Anyag’s life, and as I wrote deeper into the story I realized that this was also going to be about rewriting one’s supposed destiny. There’s often this expectation that women must sacrifice themselves for the good of others. Helping people is vital and awesome, but even that should have its limits; we have to remember that its worth fighting for ourselves, too. I find it difficult to consider themes explicitly before I write a story. It’s much more natural to me to aim for evoking a specific kind of mood or emotion. The theme tends to stem organically from story elements as a story is being written, then I try to fine-tune it in revision, after I’ve had a chance to digest it myself. Some of my favorite themes are monsters and what they illuminate about humanity; girls; friendships, especially female friendships and platonic male/female relationships; diaspora and immigration; grief; family. There’s also a specific set-up I enjoy which is all about finding someone you can trust completely. I guess it’s my version of a love story? I like the idea of “people as a home”—finding someone with whom you can be real. I enjoy making characters develop into that together. It may or may not be in a romantic sense—I think love is way more complicated than that. I tend to write to that dynamic repeatedly, whether I mean to or not. Uncanny Magazine: You recently started business school at Harvard (congratulations! ), and before that you worked in the tech industry in Silicon Valley. Do you find that your work/academic life influences your writing, or do these areas stay mostly separate? Isabel Yap: I think my work/academic and writing lives likely influence each other on a level that I’m not super aware of. Certainly they sustain each other! My tech job supports my writing, provides me with human interaction (my former start-up colleagues are some of the best humans I know), and gives me regular skill level-ups and structured approval, which are very hard to obtain in writing. On the other hand, writing is integral to who I am. If I’m not doing it then I start to feel off-kilter! Writing has also provided me with a lot of skills I use at work, like empathy (being able to put yourself in another character’s shoes!) and listening (because anything could become priceless dialogue!) I also write very clear emails and summaries, though they tend to be a little long-winded. My decision to go to business school was pretty interesting. I was actually debating between B-school and an MFA, and ultimately what tipped the scale for me was a promotion at work where I realized I had many knowledge gaps that a formal business education could fill. I really wanted to improve my decision-making ability—I always want a lot of information before I decide on things, and that’s rarely possible. So hopefully I get better at that during the two years in this program. I hope that will help me with writing decisions, too! I have to admit, managing my schedule so that I can write has been very difficult. But I’m still reading and thinking about stories, so I’ll be grateful for what I can get! Uncanny Magazine: What are you working on next? Isabel Yap: I’m desperately trying to figure out how to write longer! I have six ideas jostling for attention, and some of them are novellas and maybe one or two could be novels. But the process has felt so completely beyond me thus far. There are two ideas I’ve been talking about for years now. One is a gender-flipped retelling of the Ibong Adarna, a 16th century Filipino epic poem (which is always required reading in Manila high schools). It takes place in a secondary world much like the one in this story. Another is something I’ve been calling bishonen in space, which is sort of like Cowboy Bebop meets Reborn but with Gundam-esque politics. I’ve been struggling with how to low-tech… in space. And I’ll throw in another one I’m very excited about, which is basically a sad dude with magical healing skills moping on a planet, and the angry girl who must shake him out of his stupor to save her people. If anyone reading this has novel-finishing tips to impart—help! Uncanny Magazine: Thank you for the great responses!